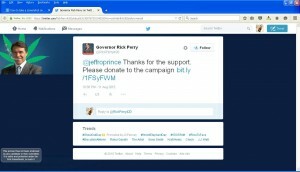 The Ricky Perry who tweeted in response to this blog post about the former governor isn’t the real Rick Perry. My first clue was the the pot leaf behind the photo. Second clue: the twitter name RickPerry420. While it wouldn’t surprise me if the real Rick Perry sampled the herb on occasion, he wouldn’t be doing it at 4:20 p.m. since he’s in important meetings at that time. I see him more as a RickPerry930 kind of guy. 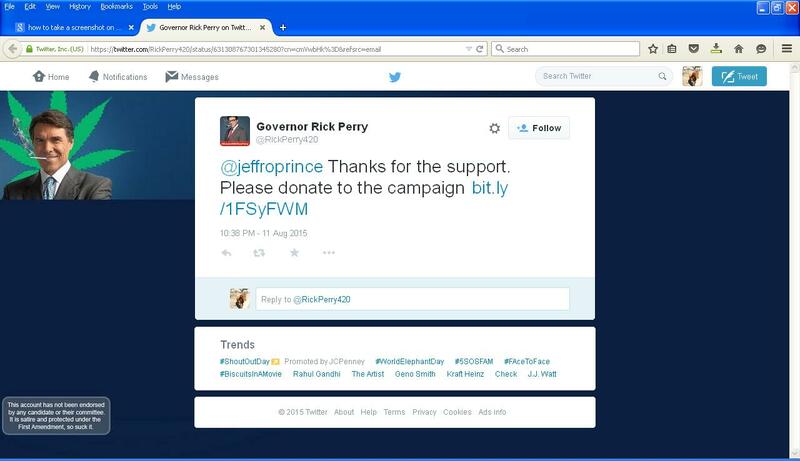 RickPerry420’s response to my original tweet includes a link. If you click on it, it takes you to a Bernie Sanders campaign donation site. Nice touch.